Lose That Girl: RATE IT/HATE IT! For Mother's Day? One of the most important occasions of the year in North America, Mother's Day, is fast approaching. Be sure to find a lovely pressie to give to your dear Mum this coming Sunday (May 10). Flowers, fine chocolates, an expensive meal out, a pampering spa session... Mums do so much for so many, they deserve a really special gift... and not just on Mother's Day. 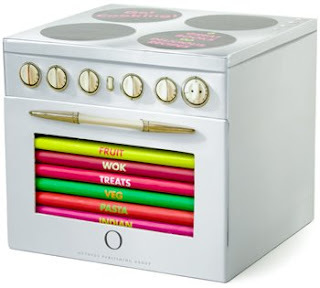 Looking around the web, I came across this delightful recipe collection, housed in a mini stove. It's really cute but it's being marketed at the mo' as a giftie for Mother's Day. I'm sure many women would love this cookery set, but why give your Mum something that pushes her back into the kitchen? Isn't Mother's Day supposed to be a day to *celebrate* your Mum? To get Mum to remove that apron and be treated herself? Mums spend far too much time looking after the needs of *everyone* else... don't give them yet another present that doesn't soothe Mum's soul. Time to treat them.... properly - and that means.... no gifts that hint at *them* treating *you* yet again! Cook books = Mum's home cooking = pampering YOU, not THEMSELVES. Sure, this set of cook books is really sweet but save it for another gift-giving occasion.